Skye Gravestones | Alexander & Sheila (Macleod) Nicolson, gd. Marion. 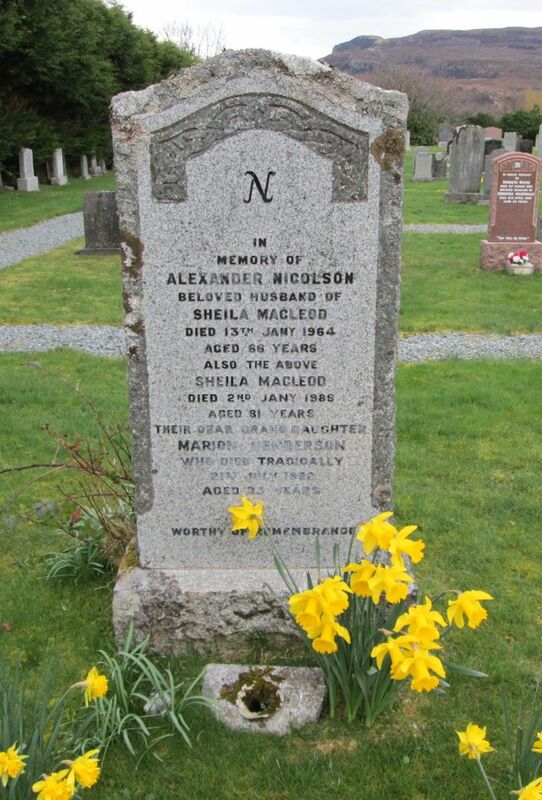 Alexander & Sheila (Macleod) Nicolson, gd. Marion. In/memory of/ALEXANDER NICOLSON/beloved husband of/SHEILA MACLEOD/died 13th Jany 1964/aged 66 years/also the above/SHEILA MACLEOD/died 2nd Jany 1989/aged 81 years/their dear grand daughter/MARION HENDERSON/who tragically died/21st July 1982/aged 23 years.